Enrollment in agriculture departments at U.S. and Canadian universities was up in 2017, with more than 125,000 American students and nearly 31,000 Canadians enrolled in agriculture and related sciences. That is exciting news for agriculture, an industry hungry for well-trained graduates. It’s also exciting for the students, many of whom have been drawn by programs that emphasize putting cutting-edge technology to work. “One of our big pushes under the university strategic plan is about students that get hands-on instruction, really get to go out in the field and do something,” says John Talbott, assistant director of the Oregon Agricultural Experiment Station. “Retention rates are much higher, graduation rates are much higher. “When you take a student out with a Garmin and say, ‘we’re going to grade this and lay a ditch across it,’ then they just get the ‘wow’ factor finally, especially if they’re just used to GPS in a car,” he adds. That “wow factor” has a special appeal that can attract non-farm kids to pursue careers in agriculture, Talbott points out. “They can say, ‘I like engineering, but I really like biological and ecological engineering—this is real stuff, not just sitting behind a drafting table,’” he notes. 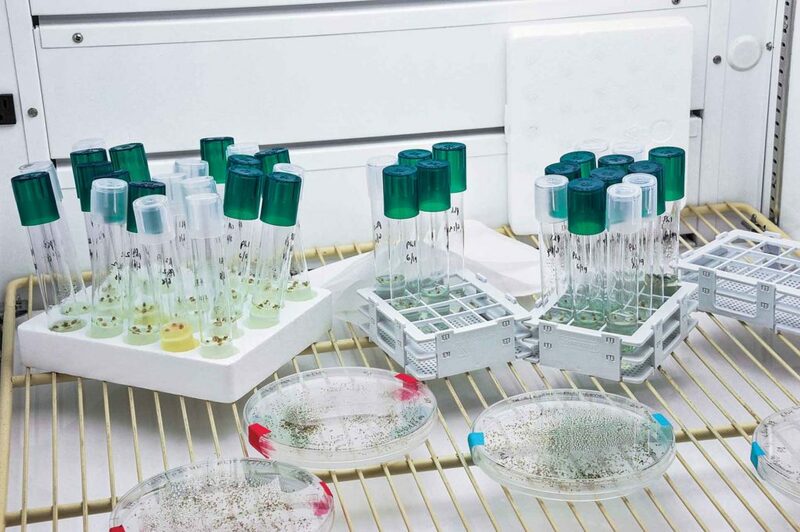 Plant breeding is where biology meets statistics. New names. Karen Daynard of Guelph, Ontario, conducted a 2010 international study through the Nuffield Scholarship program on attracting students to agriculture. She notes that some institutions illustrate the relevance of ag coursework. For instance, when University of California, Davis, changed the name of its “Hydrology” course to “World of Water,” enrollment jumped significantly. Meanwhile, the sciences are becoming increasingly linked. Talbott points to Oregon State’s Center for Genomics and Biocomputing, which attracts a wide range of researchers eager to crunch the huge numbers involved in massive data sets like genomes. “The approach is to train faculty and grad students how to use it, not to dictate how to use it,” he says. Sensors are another hot topic, Talbott notes, whether dragged behind a drone to capture air quality data or sprinkled on mountain snowpack to study the flow of water through rivers and streams across the state. Open source. Sensors are the focus of a unique makers’ space lab at Oregon State, the Openly Published Environmental Sensing (OPEnS) Lab. It’s an engineer’s playpen, stocked with 3-D printers, CNC machines, circuitry printers, and countless pieces and parts. 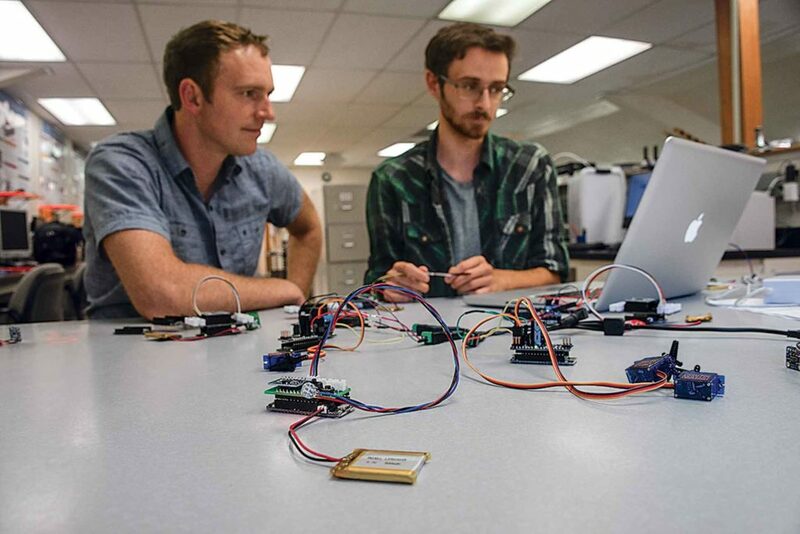 Chet Udell (left) and Luke Goertzen test a network of wireless sensors in Oregon State’s OPEnS Lab. Now in its third year, the lab is home to about 40 student projects at a time, according to director Chet Udell. Unlike many research venues, everything in the OPEnS Lab is open-source—no secrets, no patents. That encourages students to help each other gain new skills—just the sort of challenges they would face in the ever-changing agriculture industry.